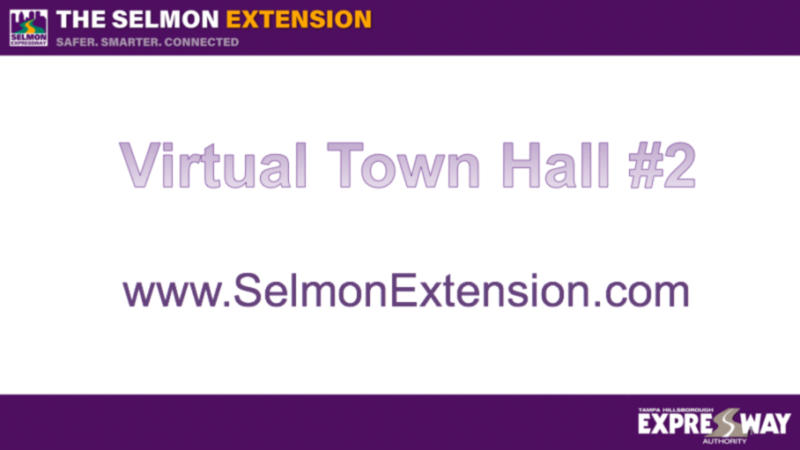 On September 28th, at 6:00 pm, the Tampa Hillsborough Expressway Authority hosted a Virtual Town Hall Meeting on the in-depth overview of the Selmon Extension. This was the second in a series of Virtual Town Hall Meetings. Why does the marketing material specifically the images of the overhead show as barely extending over the median when in reality it is going to extend 1.5′ over the sidewalk on either side of gandy? The overhead will slightly extend 1.5 into the outside lane. It will not extend over the sidewalk. Hello. Will the support piers be lighted as they (mostly) are for the current elevated lanes? Yes, aesthetic lighting will be provided for the piers and overhead structure. Are you extending it to Gandy? The Extension will provide a direct connection between the Lee Roy Selmon Expressway and the Gandy Bridge. The intersection at Gandy Blvd., and Dale Mabry on the southwest side has only one lane for vehicles exiting, and entering the expressway, causing traffic to criss-cross. Will there be a safer access/exit at this intersection with the extension? We will be extending eastbound to southbound movement all the way to Dale Mabry to minimize the weaving problem. According to the plans it is going to be 60′ wide, with 90% of gandy being only 57′ wide how is it not going to extend over the sidewalk on 1.5′ on either side? Your question will be answered during the presentation. Thanks for your patience. Your own plans show the median as a 34′ wide as typical but there is only a small section where it is wider than 16′. The median width includes the turn lanes. Upon completion of the project, there will be a 34′ median, and an 11′ and 10′ ft lane in each direction for the majority of the project. Therefore, the 57′ wide bridge above will extend above slightly into each outside lane. All traffic statics are theoretical are they not? You have not done a published plate study to know how much traffic is local or through traffic. Please refer to our website for previous traffic studies. We are currently preforming an updated origin destination traffic study (same as a plate study) and will post the results on our website. This project benefits a wide area of the Tampa Bay community. That said, many local businesses and residents in the Gandy corridor support this project, including the South Tampa Chamber of Commerce. The proposed improvement is consistent with local, regional, and state transportation plans. It will address current and future needs of the region for travel, business, and emergency evacuations. After building the toll road, how do the powers that be think people can afford the toll road, it has become so high now average people cant afford the expressway, so how many people will still use Gandy blvd after the Expressway is constructed. Extensive studies by our traffic and revenue consultants show that a large amount of regional traffic will utilize the elevated structure with the anticipated toll rates. This reduction of traffic from Gandy Boulevard will improve traffic flow for local drivers trying to access the businesses and neighborhoods along the Gandy corridor. None of your traffic studies conclusively show that the extension will do anything as the majority of the traffic congestion comes from the intersections of Westshore and Manhattan. without a plate study you have no idea if the extension will help or not correct? Traffic congestion is significant at each of the traffic signals on Gandy. Traffic Studies have indicated that a significant amount of traffic will divert to the express lanes thus reducing congestion at the intersections. I have extensively read your traffic studies, since all the information in your broadcast is theoretical shouldn’t you be telling people that? all these 40% & 44% is a theory and is not supported by any facts. The traffic projections are based upon the regional traffic model approved by FDOT and the Hillsborough MPO. Is this the same presentation that we had before or is there new updates/info? Yes, this is essentially the same presentation as the first, with some updated graphics. We plan to have new presentations in the coming months. I came in few minutes late; has there already been mention cost to the users -in taxes or toll fee increases? Overall the plan sounds good. The current project requires no right of way, no taking of businesses, and no taking of homes. The cost of the project, as well as the operation and maintenance of the facility, will be paid from toll revenue and toll bonds. The project will require 0 tax dollars. Would be great if you guys would say that in the “invitation”. I made a point of being available because I thought you would have updates. Sorry about any confusion. We will make sure to be more clear on this going forward. Traffic studies have indicated? meaning its open to interpretation. haven’t other people that have looked at the study also come up with alternative ways to fix congestion that doesn’t involve destroying the gandy corridor so the board of directors at THEA can bring home a bigger pay check? The Expressway Authority conducted a full PD&E study from 2008 to 2010. We had over 100 meetings with stakeholders and we also had a project advisory group made up of local citizens and agencies. Since the early 90s, there have been discussions and concerns with the traffic on Gandy Boulevard. Many projects have been proposed, but those projects took many residents homes and area businesses. The Selmon Extension takes no homes, no businesses, is built in an existing median and is being paid for by toll revenues. Not tax dollars. This project is needed for efficient movement of goods and people, and for evacuation purposes. It does not appear that bicycle lanes are being provided along Gandy. Is that something that won’t be able to be accommodated within the existing right-of-way in the future? Additional right-of-way from the businesses located along Gandy Boulevard would be needed to accommodate bicycle lanes. I have seen the structure, it is being designed for 2 lanes each direction despite you saying its for a single lane. and you are listing the median at 34′ when in reality the median including turn lanes for 95% of gandy is only 16′ wide. The single lane ramp with 6 foot shoulders on each side meets FDOT standards to accommodate emergency vehicles and allow traffic to pass by in the event of an emergency. What will be the speed limit? The design speed for the Extension is 50 mph. Why are there calculations for traffic based on current traffic only? Considering the likely large increase in population (especially Hillsborough). Thank you for your question. Our traffic studies include not only current traffic patterns, but projected traffic growth over the next 20 years. With all the heavy port traffic, incl. lots of semis; plus increased existing & projected residential increases of on & near West Shore Blvd., both S.&N. of Gandy; I cannot understand why there are no ramps on and off at West Shore. Not only that, but this access is crucial to the businesses located between the existing Selmon terminus and the bridge. Why wouldn’t you either install ramps at West Shore, or at least set it up so that they can be added later? This reminds me of the Skyway being insufficient for future use; or the Trop being built to short for existing use. Traffic from Westshore Boulevard can head Westbound and utilize the Gandy Bridge (as they currently can now.) However, to provide access to the facility Eastbound would require extensive right of way from businesses around the Westshore intersection, negatively impacting those businesses and local residents. Why in heaven’s name would you make this extension one lane in each direction, when the existing Selmon and the bridge are two lanes in each direction? Who is planning this? Looks like the same people as the Skyway! The traffic projections for those regional travelers bypassing Gandy Blvd via the Extension, only warrant one lane in each direction. Also, there are no plans to widen the Gandy Bridge beyond two lanes in each direction. Are any of the designers actually drivers of the corridor? Do they realize how difference of speed among drivers (from 55mph to 80mph) of current Selmon drivers will make for extreme frustration and dangerous conditions between slow and fast speed drivers (and increase instances of road rage). There is no way these are accurate. What are the basis of these growth numbers. How where the numbers estimated? We completed extensive traffic studies, which are based on the regional traffic model approved by FDOT and the Hillsborough County MPO. These studies are posted on our website. We are currently performing an updated origin destination traffic study (same as a plate study) and will post the results on our website once complete. Also noise doesn’t dissipate when higher out it goes out farther because right now noise is being dissipated by the businesses. Now the noise will go out farther and reach more homes lowering property values. The higher structure results in noise waves dissipating at higher elevations, minimizing noise impacts to adjacent property owners. Are these the same techniques used for the i275 construction that FAILED to properly adjust traffic! Which now has LONGER traffic times after completion! I-275 is an FDOT project. Move the ramps to a West Shore Blvd. interchange, get the trucks off the light at West Shore. Plan for the future increases. South of Gandy (and the DeBartolo property north), are planning huge increases. Are you not conferring with the port? What about the developers. Who is doing this? Future development along the Gandy corridor is considered in the regional traffic model. This project will divert a large amount of regional traffic to the elevated structure, freeing up local roads to the increased area residents from the developments you mentioned. The lanes on the elevated structure are designed to meet the single lane ramp requirements for a limited access facility per FDOT standards. These standards require a 15′ travel lane and two 6′ shoulders on either side. This configuration will provide adequate space to move disabled vehicles or vehicles involved in an accident to the shoulder and allow room for emergency responders and vehicles to safely operate while still providing room for traffic to move in a single lane. So I can visualize the difference, how high is the express route that we presently use from the east of downtown going to Brandon ? The Extension will be 30′ high from the ground to the top of each pierr. The Reversible Elevated Lanes (REL) between downtown and Brandon have sections that are the same height, but also sections that are lower. Have there been advances in paint technology since the original reversible lanes were constructed? The original bridge looks quite dirty, so it would be nice if a different paint could be used where that’s less of an issue (if at all possible). Yes, there have been in advances in paint technology since the original REL. We will incorporate those newer technologies into our design when possible. Is there any portion of this study that shows an alternate of having two lanes on the elevated expressway. The structure is designed to meet FDOT standards for a single-lane ramp on a limited access facility. Is the standards approved by FDOT and Hillsborough MPO created in the same method that lists a 16′ median as 34′? and a 60′ wide structure that extends and hangs over each side of the sidewalk on either side when the image shows it barely extend out 16′?